I am a very lucky lady, lucky for many, many reasons. Just one is this incredible piece of land we call home. 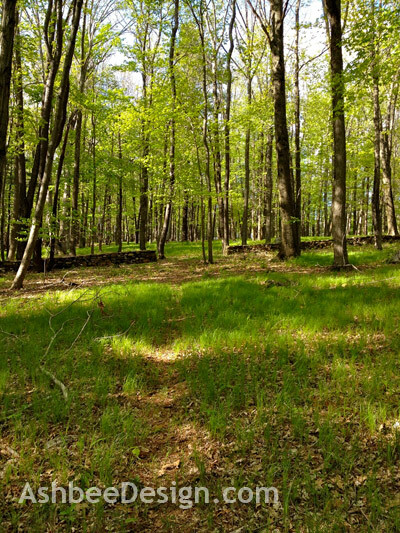 David and I live on 26 wooded acres in Connecticut and together, we have been creating a web a trails snaking through our woods. Because of the extremely heavy snowfall two winters ago and the beautiful cross-country skiing and snowshoeing, we have made it a priority to expand the trail system. Little did we know that we would have no snow last winter but how much we would love these trails during the spring instead. We have learned that the woodland grass grows naturally when we clean up the fallen debris. It is simply glorious in the springtime. In the above photo you can see the stone wall I finished last year. That was a four year project! 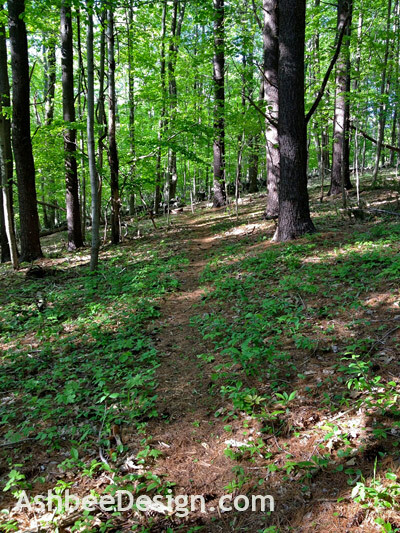 There is something about a trail in the woods that just beckons you on. We estimate that we have between 3 and 4 miles of trails and during this season we do an afternoon fast walk along them everyday. There are abundant ferns along some sections. As we walk we pick up sticks and stack them in piles interspersed along the trail. It amazing how clean the woods get if, every time you walk you also pick up the deadfall. Another section of trail traverses a hillside covered in towering pines. The green here is deeper, less spring-like. Often the floor is covered in pine cones. 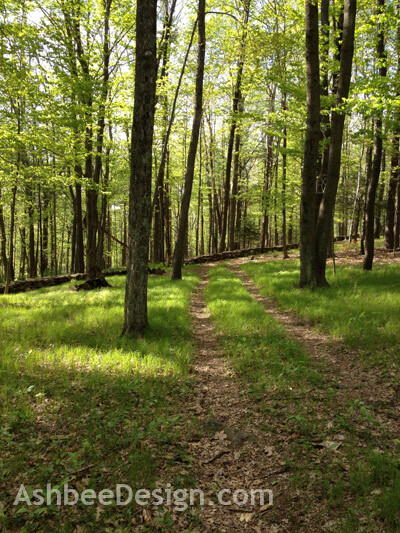 Our trail systems started from woods roads that evolved as we harvested firewood. This back woods trail was the toboggan run when the kids were still home. We got inspired to expand the trail system because our neighbors blazed a walking trail along the edge of the swamp through their adjoining property. It is a gorgeous trail and we connected our system up to it, they in turn added more. It has been a great neighborly project. I created a map of the trails using Pages. Here is a link to the blog post showing the map and giving DIY instructions for creating your own map. 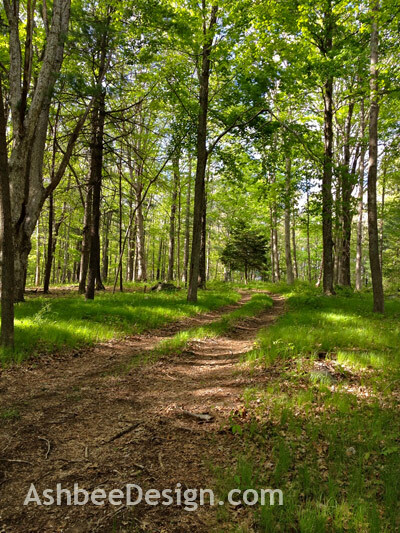 The best trails are the ones where we let nature decide the course. 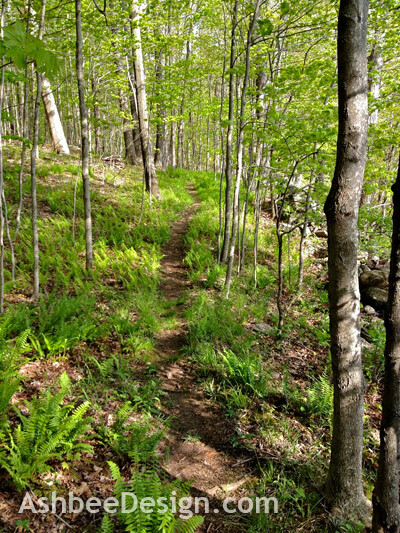 Let the trail meander around hill, slip beneath a low limb, or skirt around and interesting rock. We plan a trail using bright orange surveyor's tape tied to trees and then come through with clippers and a chain saw. The goal is to not cut live trees but to clean-up the deadfall along the way. Once a trail is cleared, we walk it daily. After several months it becomes apparent where the trail is because our footsteps have worn a path. These paths have become a source of joy for both David and I. 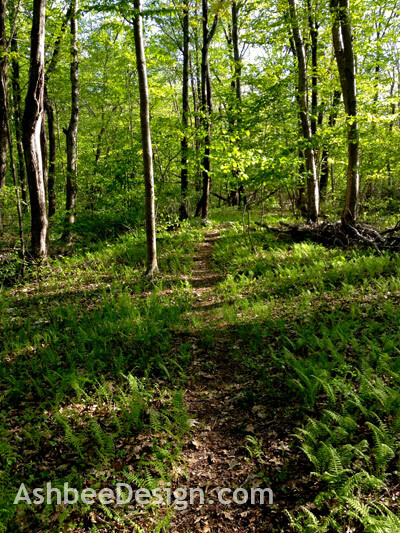 Hiking through the emerging spring woods brings smiles to our souls! Notes about these photographs: All of these photos were taken on my latest iPhone while out hiking. The camera on that little device is amazing! What a beautiful property you have. Thanks for sharing the photos. You ARE lucky! So beautiful and right there for you anytime you need to stretch your legs. Thanks ladies! It is extra special in the spring, and after a new snow fall,and during the height of autumn!